Are you someone that loves to give the gift of food? I know I am. Naturally, I’m a food blogger, and giving the gift of food is one of my favorite things to give. We all have to eat, right? For me my choice of gift has to come with some thought to it. The types of food gifts are numerous, again we all have to eat. It sure can be tempting to just quickly send something without much thought. Either because we are in a hurry, so we are pressured to make a fast selection, or we just don’t want to spend the time. This year I am asking you to take the time to consider your gift choices, whether they are edible or not. The gift I am sharing today is a gift you can give that will not only bring joy to the receiver (its CHOCOLATE! ), but also might help save the life of a child. What’s the gift? 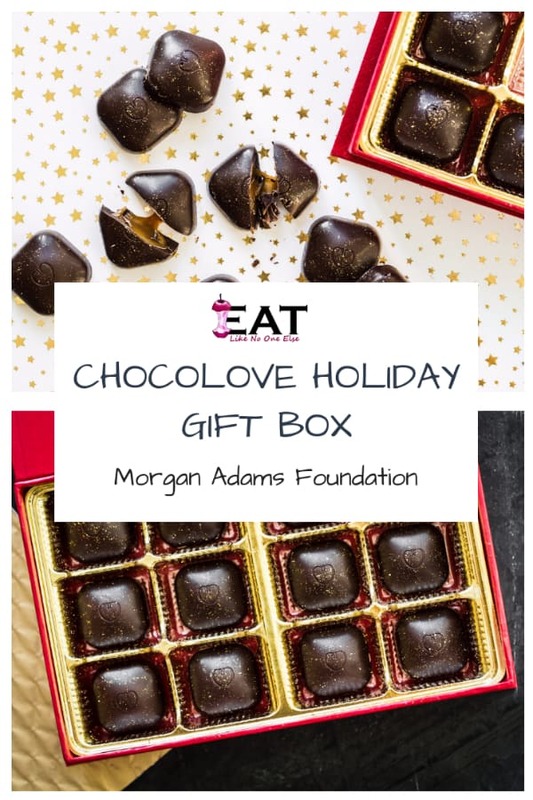 Chocolove’s Holiday Gift Box for the Morgan Adams Foundation. Wouldn’t you just love to open a box of these beauties on Christmas Day? Beats another pair of socks for sure. Chocolove is one of my favorite chocolate makers in the country. If you are a regular follower of this blog you may remember them from my post about traveling with chocolate this past summer. What I really admire about them is that they produce high quality chocolate at a price that isn’t through the roof. And they have so many choices – don’t even get me started about the dark chocolate hazelnut butter cups! 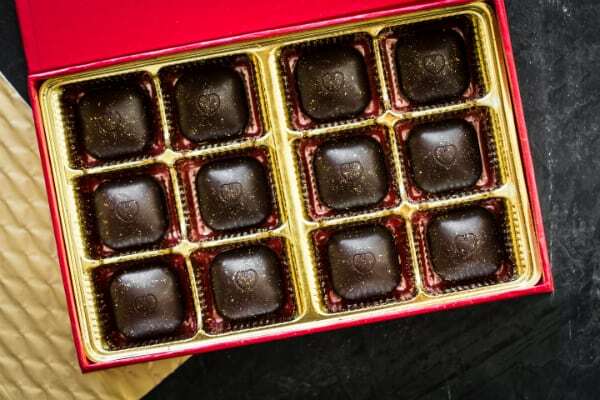 For the holiday season, Chocolove is showing the world the love by offering a box of 12 dark chocolates filled with liquid caramel. The folks at Chocolove are experts at creating chocolate that has that perfect snap when you bite into. 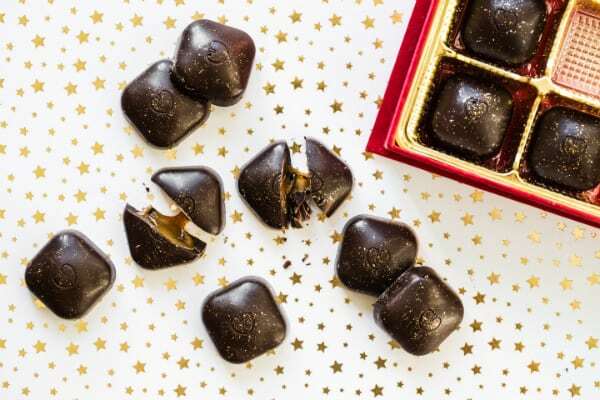 What a treat to snap through the chocolate and be greeted by delicious caramel flowing into your mouth. Friends, that is what we call contrast. If that wasn’t enough these chocolates are dusted with real gold flakes. Wait, what? These chocolate are gold? Shut the front door, the back door, the garage door, the patio door, and every single door you got. Besides the fact that it makes the chocolate look amazing with glittery particles glistening on the outside there is a purpose behind it. An important purpose at that. The chocolate gift boxes were created as a way to raise awareness and funds for the Morgan Adams Foundation. Why the gold? Here is an excerpt from their website explaining the gold flakes. Pioneering research is underway to use gold nanoparticles as a safe, more effective way to deliver cancer-fighting drugs to kids with cancer. 100% of proceeds go to The Morgan Adams Foundation to support gold nanoparticle research being conducted at Children’s Hospital Colorado / CU Anschutz Medical Campus. I by no means fully understand this or how it works – it does sound pretty sweet. What I gather is that this process will help get the medicine to where it needs to go – the cancer cells – and avoid damaging the healthy cells. It also reduces the amount of drugs needed. This gives hope for a better life and less complications after treatment. Often with cancer treatments, you have to do what is necessary to save the life. If there is a way to save the life right now and make for a better life later, that is something to really get behind. It’s not a singular focused approach. The process is still being developed, so we need organizations like Morgan Adams to raise money to support this important research. You might be wondering, who is Morgan Adams? She was a real person who sadly lost her battle with cancer. Her parents Steven Adams and Joan Slaughter experienced the suffering of losing a child to cancer first hand – I can’t imagine that anguish. This tragic experience gave them empathy for other parents. Two years following Morgan’s death, her parents joined the Onocology Advisory Board at The Children’s Hospital in Denver, Colorado. They desired to learn more about research and treatment options as well as being informed of the unmet needs in pediatric cancer research. On the Morgan Adams website you can read about some of the stories of the kids they have been involved with. Some of the stories have a happy ending, some don’t. Hopefully with the work they are doing, more happy endings are the future. When you give to a cause often the proceeds don’t just go directly to the cause itself. They have to go to pay for advertising and often really high CEO salaries. When it’s a business selling a product for a cause, the proceeds they usually donate are quite low. Many times I have seen fundraisers where only 5-10% of sales actually go to benefit the charity. In this case, Chocolove is donating all the proceeds to Morgan Adams Foundation. I love it. Chocolove isn’t in it to earn money for themselves, they are doing it for the cause. That’s so genuine and amazing to see a legitimate sacrifice a business is making to benefit their charity that are championing. I got a chance to connect with the Founder & Executive Director of the Morgan Adams Foundation, Joan Slaughter. I asked her what it means to her to have Chocolove supporting Morgan Adams with these holiday chocolate boxes? It is hard to quantify, to be honest, because it means so much to us. The project funding partnership in and of itself is amazing, and having the opportunity to help explore a new drug delivery mechanism is personally very important to me – whatever we can do to lessen harm is a big driver for me and having a partner to help move a new idea forward is a very, very significant gift. Beyond the project itself, though, this opportunity – the holiday boxes – has provided us a very tangible way to carry our mission and the importance of funding pediatric cancer research forward to the broader community. That’s huge for us. The chocolates give us a way to share our story with folks who don’t normally come to our events and who might not otherwise find us. They are the sweetest (and easiest!) way we have ever had to bring our work and our organization to a new, wide-ranging group of people who might want to help us, too. We take them with us everywhere we can – and because they are SO DELICIOUS, they get folks talking to us, and that is worth its weight in gold! Order a box or two for a family member or friend this season and support an important cause. No one will complain! Are you ready to order a box? Each box of limited edition dark chocolate with caramel comes with a Happy Holidays card attached to the top. To order your gift box, check out Chocolove’s website or call the friendly people at Chocolove at 888-CHOCOLOVE.